Chief Minister Pema Khandu today held an interactive session with the heads of the department and government officers here in presence of DCM Chowna Mein and MLA Kaling Moyong. Speaking during the occasion, CM said the state is eager to march ahead in all development spheres and invited the officers for their say on way forward. 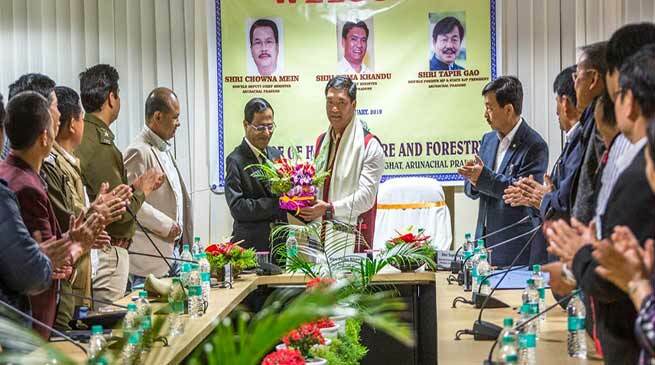 He said Arunachal is a blessed land and has potential to become one of the richest state in India. He said looking after the welfare of 1.4 million population of the state should not be a Herculean task if there is will to serve. He said the state along with Nagaland has earned bad reputation in corruption and said it was time to come out of such menace. He said those in position today must take the lead else we can’t expect things to get better later on when having lost the opportunity we could have made things better when we had the chance.